Only 500 metres from Hamburg Central Station, this hotel in the lively St. Georg district offers spacious rooms, free Wi-Fi in public areas and daily buffet breakfasts. 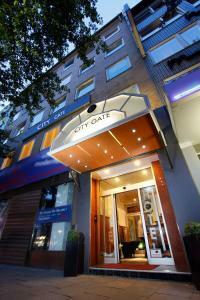 The spacious rooms at the non-smoking City Gate by Centro Comfort feature cable TV and a telephone. Each room is decorated in its own style. The popular Mönckebergstraße shopping street is just 1 km from the City Gate. Direct S-Bahn trains run from Hamburg Central Station to Hamburg Airport in 25 minutes. The hotel's reception is open 24 hours a day.